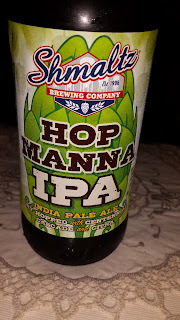 This week's Sunday Night Suds looks at Shmaltz Brewing Company's Hop Manna IPA. I found this beer in the NY version of Total Wine & Liquors on Old Country Road in Westbury. Due to New York's antiquated/paternalistic/protectionist (pick any other adjective you choose) liquor rules which ban stores from selling beer and wine in the same store. As such when Total Wine finally came to New York (what took you so long) they wisely chose to subdivide the space previously occupied by Sports Authority (OBM). They had to build separate entrances to each store along with individual cashier sections, but the stores are separated only by only a thin wall. The beer itself poured a lighter copper than I was expecting, with some midrange carbonation (not rivaling a Saranac Beer, but not flat either). Although the color and carbonation was slightly lighter than I prefer, this American Pale Ale was not lacking in flavor. There were nice floral hop notes and some citrus, but also a bit more malt than I was expecting. The resulting brew was a solid example of the American Pale Ale style which would go well with charred meat, stews, burgers and, well, basically any meat! Shmaltz Hop Manna IPA is under the Kosher Supervision of the KSA, as are many, if not all of the Shmaltz products. To see what the experts on Beer Advocate think about the brew, please follow this link www.beeradvocate.com/beer/profile/262/78791.